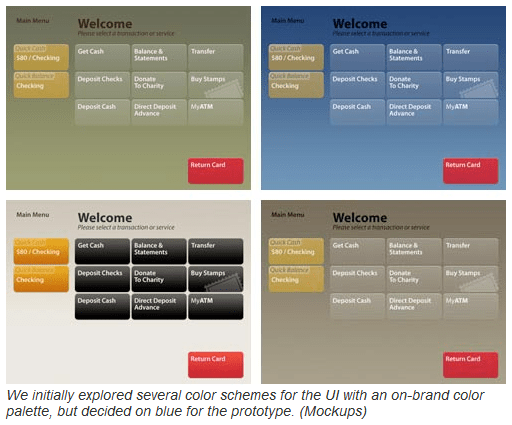 Wells Fargo hired Pentagram in the fall of 2005 to begin work on a new user interface for their ATMs. Wells Fargo was in the process of upgrading their ATMs with touchscreen monitors. This was a relatively slow process, since there are about 7,000 ATMs in the field, and any upgrades are expensive. But with the vast majority to be converted during 2007, this was the perfect time to create a fresh UI that would fully utilize the touchscreen capability. Previous PostInstant Messaging Proves Useful In Reducing Workplace InterruptionNext PostFacebook for grandma?